The following is a guest blog by Service & Repair industry expert, Michelle James. Looking back, which I only do as a reflection of key learnings, in my mind’s eye, 2017 marks a “beginning.” A time where the wireless repair industry began to notably move from an industry segment resembling the wild, wild west to an industry segment that more closely resembles organized maturity. As with any emerging industry, there were a few bumps, challenges and moments of celebration. I am proud to report that finally, I can see a change in the tides. The sea is starting to rise in concert. The industry is beginning to accept that device repair is not a temporary channel. It is a real consumer category. Most professionals in the reverse logistics space would agree it is not going away anytime soon. The time to grow with it is now. The market remains at $4B in size, according to analysts. As in all growing market segments, as expected, there were supplier consolidations this past year, new entrants and a handful of exits. In the retail arena, the strongest stores continued to grow both in number and in profitability, albeit not at the same pace as the explosive growth of 3 years ago. There were also several store conversions from independent to franchise, with independent doors still making up the largest total door count. On-demand seems to continue to trend stronger this past year over other years, with the growth of licensee programs and a few new entrants in the on-demand market, many of which support insurance fulfillment. Procuring quality technicians appears to be on the rise. In 2018, I invite all of you to reach out to all speakers from any of our events for expert advice. Community is critical to the success of any emerging market channel. The main reason I am in constant pursuit of curating agendas, speakers, and building community is to help the industry up the onramp of success. Producing events is daunting, however very much a foundation of my passion for making sure all of you stay connected with the best possible resources. 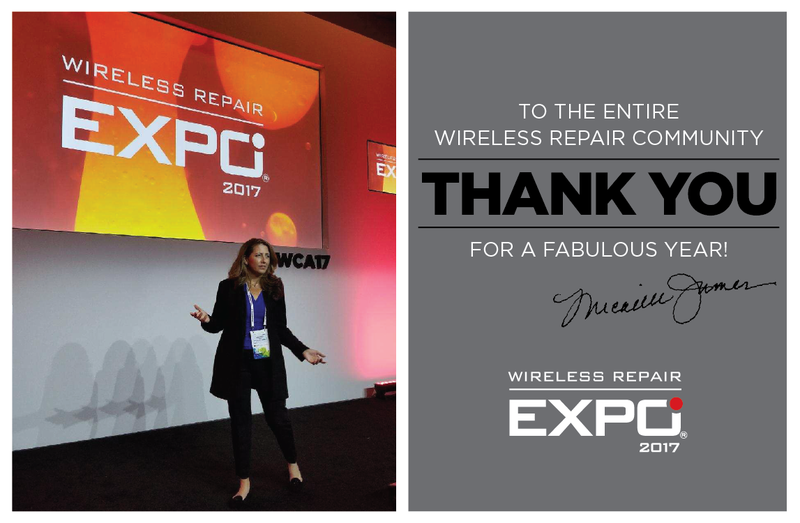 In September, the Wireless Repair EXPO 2017 hosted 60+ exhibitors onsite at the inaugural Mobile World Congress Americas in partnership with CTIA in San Francisco. More than 600 attendees participated in the workshop sessions where 27 speakers shared valuable insights to the wireless repair market. Sessions included CEO of Cellpoint Corporation, Ehsan Gharatappeh, a veteran in reverse logistics who addressed OEM compliance and chain of custody processes. CEO of Phone Medic, Christine Ricci, a national speaker with in-depth knowledge of leadership trends, shared advice on how to gain a strategic advantage through organizational leadership. Jeremy Willis, Director of Strategic Partnerships for AGiRepair hosted a power-packed panel discussion including industry leaders from Samsung, uBreakiFix, iQmetrix and Katalyst. Stacy Hamer, Director of Professional Services at iQmetrix, addressed their new retail POS module specifically built for repair stores. From Asset Science, John Sheeran, CEO, and Don Riley, VP of Sales, discussed the importance of proper device diagnostics. Interactive sessions with Seth Dare of Gadget Guard and Aaron Bower of VoiceComm touched on the importance of accessories sales. Jack McArtney of Recipero addressed the importance of properly handling consumer data on devices and IMEI verification. Chris Johncke, CEO of iFixYouri, hosted a panel discussion with founding members of the Independent Repair Coalition. Shiv Dawadi, CEO of Apptoe, presented a demo on how to amp up repair retailers’ customer engagement. James Tenser, president of VSN Strategies, highlighted overall retail trends. Data privacy for the smartphone industry was a hot topic covered by Richard Steinnon, Chief Strategy Officer of Blancco Technology Group. Jonathan Bergman, CEO of HireWellNow, shared 10 insider secrets to better hiring. In conclusion, Pasi Pihlman, Sales Director of Piceasoft, discussed device lifecycle solutions. Big news! You will all be happy to note, for 2018, we have moved the Wireless Repair EXPO back to Las Vegas in March! This year we will be partnering with CCA, the Competitive Carrier Association. We will also host a handful of Wireless Repair Roundups in 2018, beginning in April. All event dates and locations will be announced at WirelessRepairEVENTS.com. In review, this year also marks a new collaboration effort with the launch of the CTIA Reverse Logistics & Service Quality Working Groups where the industry is fast at work developing industry recognized standards for the aftercare of devices. It has taken a long time, and few gray hairs, to facilitate aligning 41 company stakeholders encompassing all carriers, OEMs, insurance providers, depots and suppliers. This has been an incredibly rewarding experience, and I am honored to chair this effort. I am very excited about the collaborative progress we have begun these past few months. Many more RLSQ details to share as 2018 unfolds. You will want to stay tuned! Let’s grow the channel, our community and continue to collaborate for success. With over 20 years’ experience in marketing, retail and wireless, Michelle James is the producer of the Wireless Repair EXPO. After 9 years spent creating innovative sales solutions and in-store campaigns as Marketing Director for Levi Strauss & Co., in the early days of wireless, Michelle helped mobile device manufacturer, Nokia, climb to #1 global market share. Since then, Michelle has supported wireless retailers nationwide in community building, event production, brand management and for the past five years has rallied the wireless repair industry to collaborate better together and mature into a sustainable consumer category.